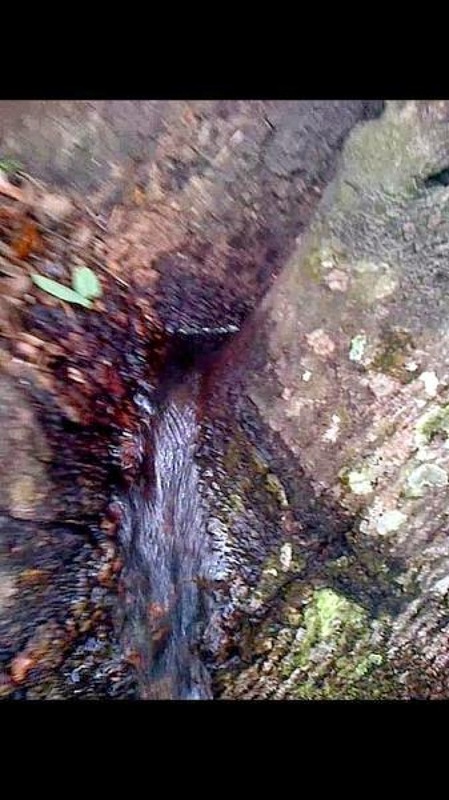 Miracle Water Gushing Out Of A Tree At The Federal University Of Technology Owerri Nigeria! The Federal University of Technology situated in Owerri, Imo state, southeast Nigeria, witnessed what many has described as the unbelievable on February 11, 2015, Wednesday as ‘miracle water’ was seen gushing out from a tree around the university bus park, Talk of Niija reports. According to an eye witness Facebook account, the water was seen gushing out of a Nimp tree. It was gathered that moments after the discovery was made, villagers from Umuchima, Eziobodo, Ihegwa and environs joined students from FUTO to get their share of the miracle water. Interestingly, the Vice Chancellor of FUTO, Prof. Cyril Asiabaka was reported to have visited the scene to witness the running out of water from a tree. I’m marvelled. This happened in my school ( Federal University of Technology Owerri) today. I was walking home with my friends and saw this huge crowd across the road, we decided to go take a look of what was happening and to know why people were carrying empty kegs and bottles towards the crowd. Lo and behold, there was water gushing out from a tree. Yes! There they were, Nigerians doing what they know how to do best. People started thanking God for the miracle water as it will heal them of all their diseases. The water looking dirty and coloured (I guess that’s what their God can give). Some drank the water, some washed their body with it, some took it home. What marvelled me most was seeing students from the Department of Microbiology and Biochemistry drink the water. I have nothing else to say, I just hope I don’t hear of the outbreak of cholera, typhoid and so on. Something unnatural occurred at Federal University of Technology Owerri today 11th February, 2015. Around 10am today, students and staff of the institution were seen rushing to the site where water (I mean clean water) gushed out from an old tree opposite the All saint’s chapel FUTO. Most of the students struggled to fetch the water as they believed it was a sign from GOD that FUTO is in the hands of God. An eye witness who spoke to our team on anonymity said “We saw the water coming out of the tree with full force as if it was being pumped and we all rushed to fetch the water because we believe it was from God”. According to a professor in the institution, he said “a big pipe running across that tree may have burst and water due to capillarity rose up the tree and is coming out through the pores of the tree”. As at the time of filling this report, we are still yet to ascertain where the water came from as many believed it was from God. We therefore use this medium to urge FUTO students to take things easy and make sure they get their own water from the tree with their jerry cans before it stops flowing.